The WinFAST autoGUI builds the presentation layer with all that implies. We begin by intelligently interpreting character-based applications and transforming them, in real-time, into a web-oriented Graphical User Interface. This GUI is a true 32-bit presentation layer that enables your applications. This graphical presentation layer tightly integrates your existing host application with desktop, network and browser based applications; all within the presentation layer. Host screens, now rendered, can access e-mail, internet links, desktop applications, the network, help desk and more...all blended within the GUI presentation layer. 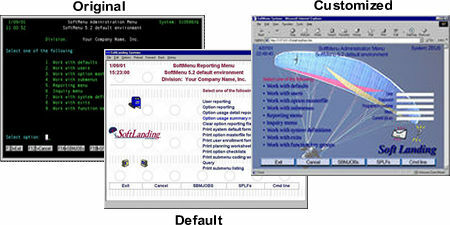 There are effectively two components within WinFAST: the autoGUI component and the application extension component. The first component, autoGUI, is our hallmark. This autoGUI feature means the application can be ready to deploy immediately without the cost and time associated with a screen-by-screen effort. With a baseline product ready for deployment, developers can then focus their efforts on extending and improving the more prominent and heavily utilized areas within the application over time, using the extensible features of our second component – our built-in customization suite. Features and enhancements like web links, images, combo boxes, etc. can be added to your application incrementally, over time.